* Use the provided connector cable an dconnect the USB plug to any 5V power source. * Connect the micro-USB plug to the Dcinput socket of the charger base. *when only one Li-ion battery is chargerd, the current is 1A, no matter 5V 1A or 2A input. *Automatically identify the attery types. The charger has reverse connection protection. If the battery was put into the charger reverse, the screen of charger will splash. Universal Battery Charger: Compatible battery: 26650,22650,26350,20700,21700,18650,16340,17670,17500,17350,16650,10440,14500,18350,18500(Li-ion).Outside the specification batteries are not suit for this battery charger. Multiple functions:Input and output functions.This universal battery charger has a output function,it can be use as a mobile charger by this.Atttention: when use as mobile chargger the output is only by the right batttery. Safty and Durable: This battery charger has overcharge,overdischarge,short circuit,anti-connect battery detection and protection function, which can protcet the safty of batteries and charger, making them more durable than normal. 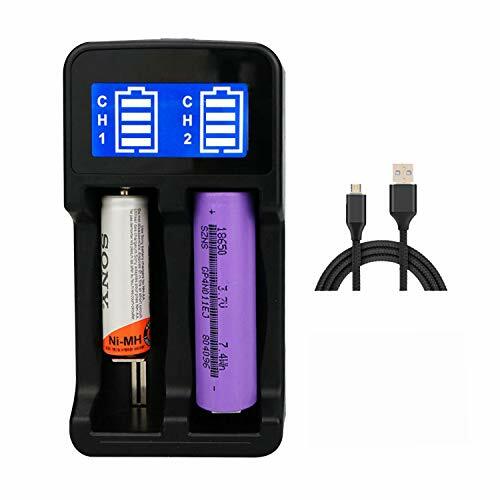 What include: Universal battery charger *1, USB cable *1, Instruction manual *1. and 100% product guarantee. If you have any questions about this product by Aitures, contact us by completing and submitting the form below. If you are looking for a specif part number, please include it with your message.